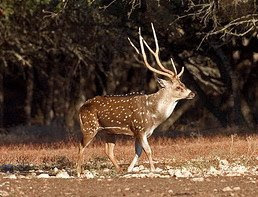 Native to India, where it is known as the "chital," the axis deer was introduced into Texas about 1932. In 1988, free-ranging herds were established in 27 counties of central and southern Texas. At this time, it also occurs as a confined animal on ranches in 67 other counties. Axis deer are the most abundant exotic ungulate in Texas. Axis deer are inhabitants of secondary forest lands broken here and there by glades, with an understory of grasses, forbs, and tender shoots which supply adequate drinking water and shade. They tend to avoid rugged terrain. Their food consists largely of grasses at all seasons, augmented with browse. Green grasses less than 10 cm high seem to be preferred. In Texas, they graze on grasses such as paspalum, switchgrass, and little bluestem. Sedges are favorite spring foods. Browse species include live oak, hackberry, and sumac. These animals are gregarious and usually are found in herds ranging from a few animals to 100 or more. In each herd the leader is usually an old, experienced doe. Unlike our native deer, adult male axis deer normally are found living with herds of young and old animals of both sexes. Anatomically, axis deer are more closely allied to the North American elk than to our native deer. Like our elk, rutting male axis deer emit buglelike bellows, and both sexes have alarm calls or barks. 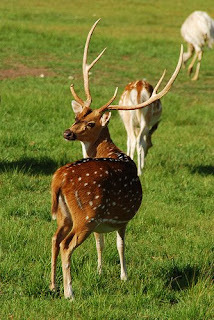 The reproductive pattern in axis deer is similar to that in domestic cattle. In the wild, bucks with hardened antlers and in rutting condition may be found throughout the year. Each buck seems to have a reproductive cycle of its own which may not be synchronized with that of other bucks in the herd. 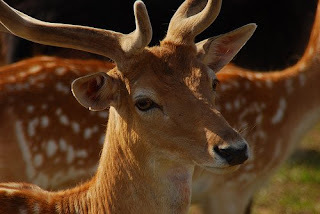 Consequently, when some bucks are coming into rut, others are going out or are in a non-breeding condition, with no antlers and with their testes quiescent. Likewise, females experience estrous cycles throughout the year with each cycle lasting about 3 weeks. Gravid females may be found throughout the year, but the major breeding season lasts from mid-May through August with a June-July peak in activity. The bucks make no attempt to collect or retain harems of does, but instead they seek out and service the does in each herd as they become receptive. 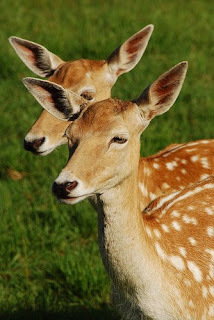 Normally, only one fawn is produced per pregnancy after a gestation period of 210-238 days. Reflecting the summer peak in rutting activity, nearly 80% of Texas fawns are born in early January to mid-April, although fawns may arrive in all seasons. Following parturition, females again mate during the subsequent breeding period, so that adult females tend to produce one fawn each year. Twins are rare. Fawns begin eating green forage by 5½ weeks of age, but weaning is delayed until 4-6 months. Permanent dentition is acquired when 2½-3 years of age and adult size is reached at 6 years for females and 4-5 years for males. Possibly, does may breed in the breeding season following birth, but most do not breed until the following season, when 14-17 months of age. Lifespan is 9-13 years, although zoo animals may reach 18-22 years of age.